The synonym for versatility, Kishore Kumar did every possible job in the industry – Playback singer, actor, lyricist, composer, producer, director, screenwriter and scriptwriter. Here comes a documentary made roughly decades ago and nowhere available to buy. Even its makers no longer produce it. Zindagi Ek Safar – A must watch for all who love Kishore Kumzar and his multi talented career of an immensely creative personality, Zindagi Ek Safar is a documentary and is the one and only video documentary made in 1989, on the happening life of the most versatile musical phenomenon called Kishore Kumar. Directed by Sandip Ray (son of the renowned film-maker, Satyajit Ray), the movie talks about KishoreDa’s lesser known childhood, his energetic career as an actor and his incomparable contribution as a singer along with famous clips of his uncountable melodious songs which are still cherished by hindi film music lovers living all over the world. Intelligently compiled by Sandip, the movie not only showcases the brighter side of KishoreDa’s persona but also talks about the grey shades of his identity, which were sadly publicised in the media as an eccentric behavior towards insanity. 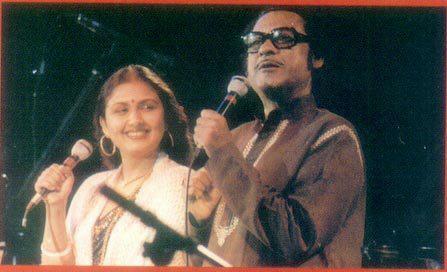 Ironically, Kishore da himself talks about it with Lata Mangeshkar in an interview featured in the documentary. Exploring different phases in the life and career of KishoreDa, as an actor, producer, director, singer, composer and lyricist, the movie smartly makes us familiar with the real truth behind many famous myths about him. Calling all kishoreda fanatics to send articles, write-ups, blogs, rare photos not available on internet etc to mailto:sanjiiv@sanjiivkumaar.com and I'll post it in blogs along with YOUR credentials. AROUND 150 + HD QUALITY VIDEOS ADDED. CHECK THE VIDEO SECTION!! !